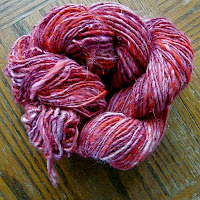 Well it's a good thing I spent my last farmers market spinning, 'cause the yarn was flying off the table Saturday! Some stash builders, some gifters, and a repeat offender! This lovely lady started with a skein of alpaca blend... And made this! And made this! A neat crocheted scarf with little beads added on either end. The sparkle of beads and the sparkle of the yarn were too good! Makes you wish for more of that cold weather we've been having... So happy knitting and crocheting Pinkilicious Yarn fans! 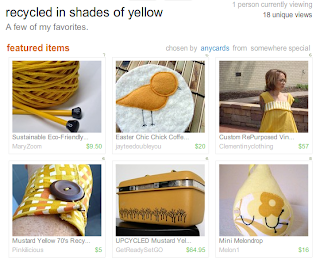 Fellow Etsian Anycards made this fabulous treasury with recycled/upcycled goods in lovely shades of yellow. 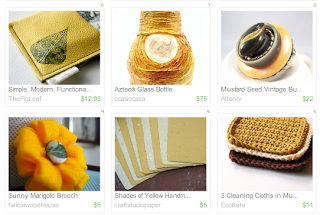 Go check it out and support my fellow eco-crafters! My sister has custody of the Captain's Hat this year, but I still talked like the captain! Good times in Boulder's City Park. So tomorrow is my first try at the Boulder Farmers Market. It is also International Talk Like a Pirate Day. 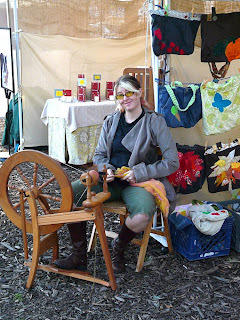 Thus, I will be in Boulder, at the market, spinning like a pirate... pics to follow. 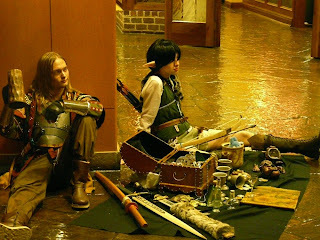 Any one who thinks craft is dead, has never met a cos-player. There is nothing simple nor storebought about this amazing pieces. 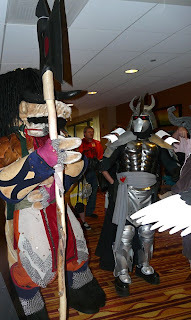 A life size (like 7 1/2 foot tall) Tauren and... well I don't know who that other guy is, but it's awseome. 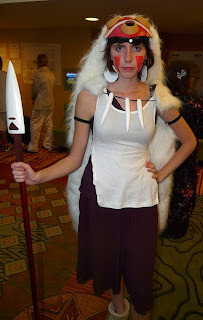 Time, dedication, and the willingness to wear a really hot costume to a public place and pose for photos. Some went for the very authentic and simple fare, well done and sleek. Others chose more elaborate characters, no less classy mind you. 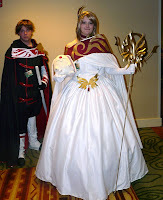 I don't know who these folks came as either, in fact I reconized like 25% of the costumes, I'm not an anime addict. Not that the outfits were less interesting because I didn't recognize them! 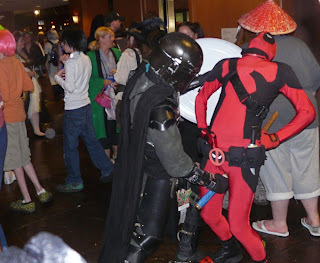 Wierdos abound, I have no idea what's going on, but the Boba Fett guy had Captain America's shield... And poor Deadpool... who knows? 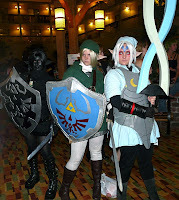 Then there are the group costumes... Link in many forms! Notice that black link does what black link does best... meld into the shadows! Good for adventuring, not for photos. 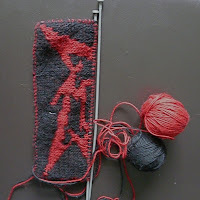 I am considering the epic knitting challenge from the Zelda group on Ravelry, an entire link cosplay outfit, knit, and handspun for that rustic realism. It's back to school season, but the political madness goes on... So some people are concerned about the President addressing the nations school children, fears of indoctrinization to a "radical far left agenda". Firstly, the crazies who are making these claims are often the same people who just a scant few years ago chided us for being "un-patriotic" and questioning the administration. We bad mouthed the President, you have the right to bad mouth the President, but let's stick to things that are truly issues. Debate health care, debate the bail out (Bush started it, Obama is just keeping the momentum) debate education policy if you will! Study hard and work to get ahead is not, or should not be, a controversial topic. Republicans, I love you guys, really. Now make the nutball talk boxes of the neo-con stop claiming to speak for you. Take the party back, please! Secondly, Obama is not a Socialist. Ask the socialist party, he's not a member. And he failed to give us universial state-run health care, the socialist are dissipointed. Furthermore, what's wrong with socialism anyway? Is this a democracy? Can I not create a political party to further my vision of what is best for a nation reguardless of weather or not the party agrees with capitalism? Why, after all these years is communism such a dirty word? (yeah we know, it didn't really work out, that's irrelevent) Is the cold war over yet? Well moving madness has finally calmed down, and I have time (and energy!) 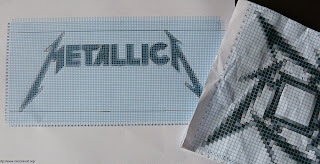 to sew again. 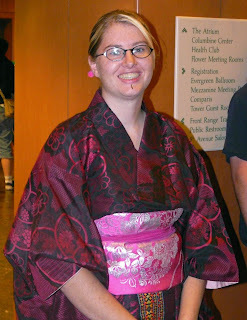 I found some awesome broadcloth in the dumpster last week, a big piece, so I made myself a top from my usual corset pattern. makes the medicine go down. However, A spoonful of Green Chili makes things really f-in hot!